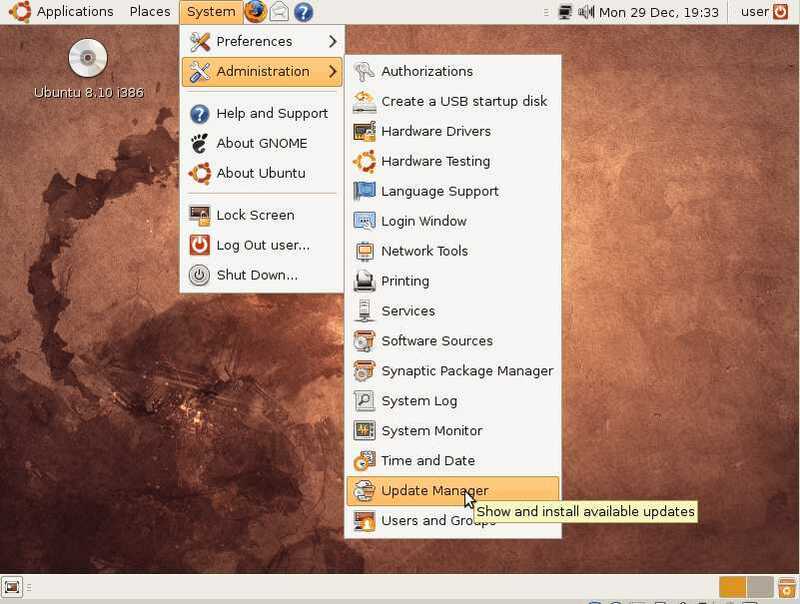 Why Download Updates and Patches for Ubuntu 8.10? Updating Ubuntu 8.10 on a regular basis like once a week when updates are available can help keep your computer secure, and running better. 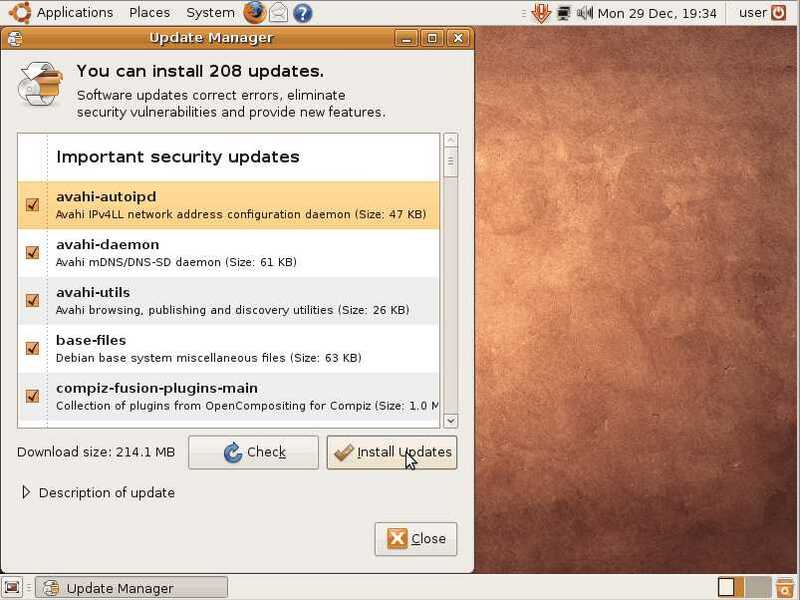 Updates can fix known security, reliability and performance bugs which the Ubuntu software developers found and fixed in the most recent updates. Here is a video I made which teaches you how to manually update Ubuntu 10.04 Linux which is exactly the same steps you take to update Ubuntu 8.10 LTS on your computer or laptop. Step 1. Click on System Menu on the top toolbar on the desktop. On the System Menu, click on administration sub menu. Lastly, click on Update Manager near the bottom of the administration menu. Step 2. 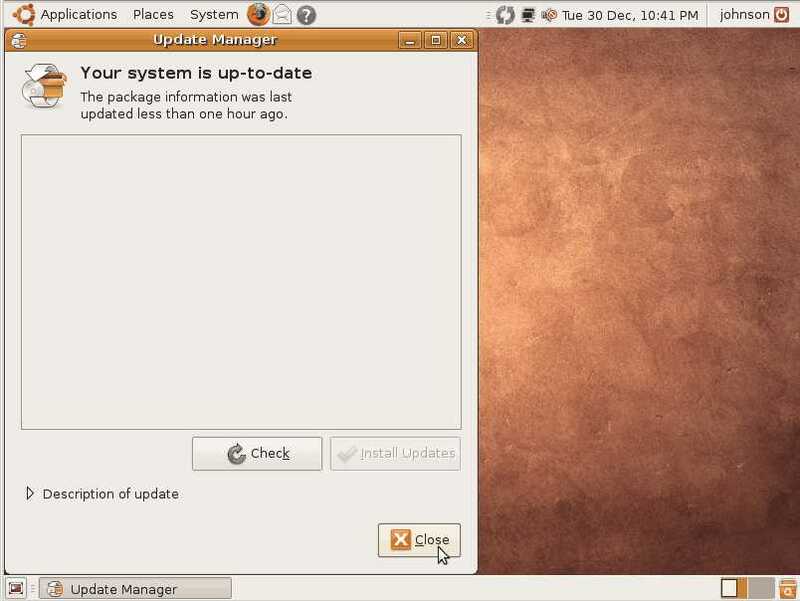 Click the Check button on Update Manager, and wait for Ubuntu to check for updates on the internet then click on Install Updates button next to the check button. Step 3. 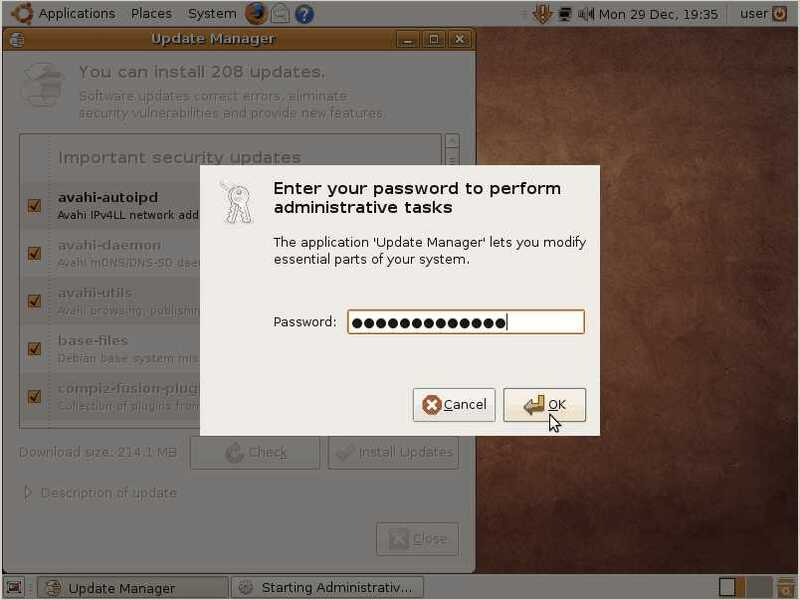 Type in your admin user password you made when you installed Ubuntu on your computer then press the OK button. Step 4. Wait for the Updates to finish downloading then press the Close button. Step 5. You can now Restart or Shut down your computer by clicking on the red square button on the top right of your desktop and then pick restart or Shut down. Congrats, you now know how to update Ubuntu 8.10 from the Ubuntu Update Manager. Note: If you run into problems when updating Ubuntu 8.10, try restarting your computer, and try running Update Manager again. Also, make sure that your computer has an internet connection by opening FireFox browser to browse the web. If you do not have an internet connection, try unplugging and re-pluging your Cable or DSL modem, and router if you use a router,hub, or switch are all plugged in properly to the power outlet and to each other via networking ethernet cable.. If your DSL or dial-up modem is directly connected to your computer, you need to ask your Internet service provider for the username, password, and other credentials to log-in to the internet. If you are using wireless internet, make sure you set up Ubuntu to use your SSID and wi-fi password for going online and accessing your wireless internet. I'm not going to explain how to do it because it is a very long topic to cover, but you can search YouTube, Google, Yahoo, and other search engines for "Ubuntu Internet troubleshooting." It is also possible that your network ethernet card, wi-fi card, or dial-up modem is not compatible with Ubuntu 8.10 because Ubuntu does not have drivers for your networking devices. The easiest thing to do is buy a new PCI or USB ethernet networking card, dial-up modem, or wi-fi card from a known company like 3com, D-Link, Cisco, and other companies which makes networking devices which are compatible with Ubuntu Linux 8.10. 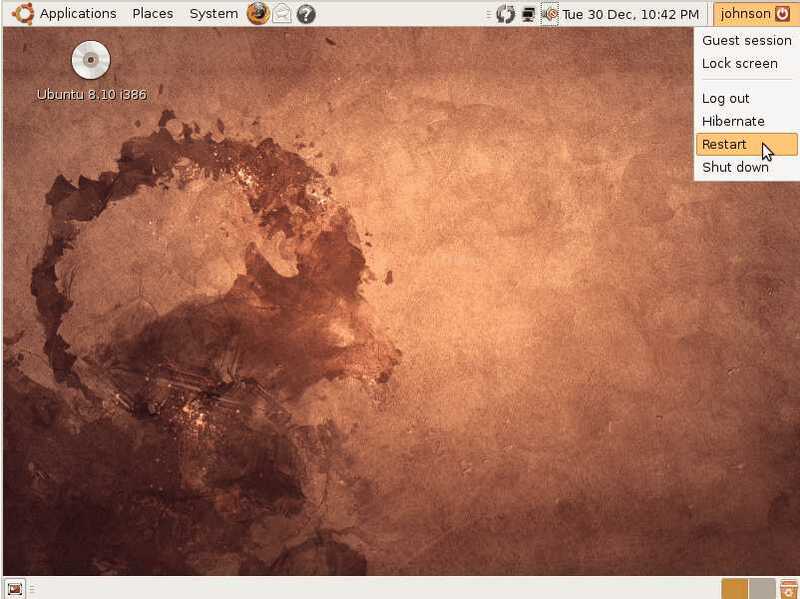 You can search or post a question on forums and blogs dedicated to Ubuntu Linux to see what other members are using when it comes to networking devices in Ubuntu 8.10.